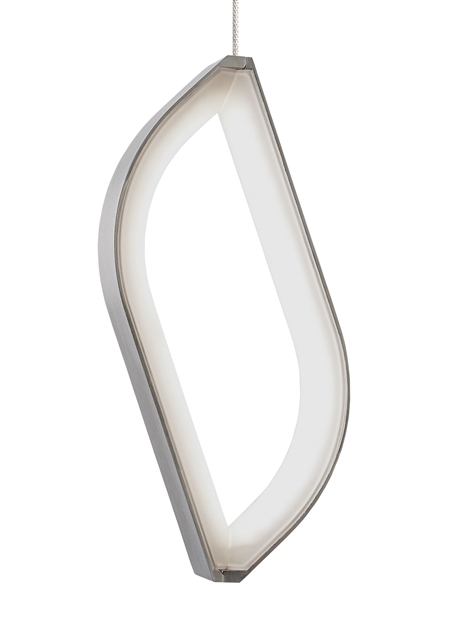 The Folium pendant from Tech Lighting is stunning with its ultra-modern nature inspired design. The die-cast aluminum leaf-like silhouette quickly gives way to an ultra-modern aesthetic created by an inward firing LED light source and asymmetrical hallow center. Scaling at 8.3” in length and 3.9” in diameter the Folium pendant is ideal for living room lighting, bedroom lighting flanking an end table and countless commercial lighting applications. The Folium ships with a fully dimmable energy efficient LED lamp saving you time and money. Pair the Folium pendant with the Monorail system by Tech Lighting for greater design customization. Includes 6 watt, 240 net lumen, 80 CRI 3000K LED module. Ships with six feet of field-cuttable suspension cable. Dimmable with low-voltage electronic or magnetic dimmer (based on transformer).